In this post I wanted to talk about the rental car status offered through the Amex Platinum Card. Just for having the Amex Platinum Card you get status with three major rental car companies, which is a benefit I know many value. Personally I don’t rent cars very often anymore, as I far prefer taking an Uber, but others certainly feel differently. What rental car status do you get with the Amex Platinum Card? 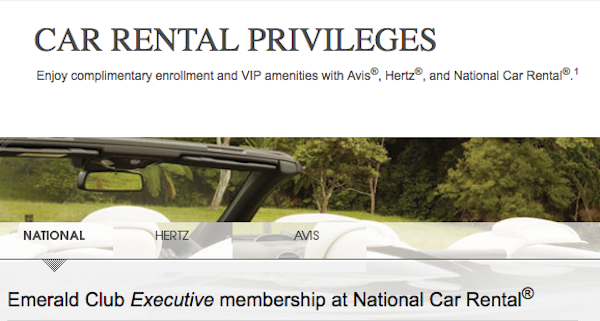 American Express has what they call the Car Rental Privileges program, which gets you status and even discounts with Avis, Hertz, and National. You’re entitled to these privileges for as long as you have the Amex Platinum Card. Status with a rental car company can get you car upgrades, priority services, etc. Log into your Amex Platinum Card account on this page, and you’ll see all the options to take advantage of your car rental privileges. You’ll have the option of either enrolling in the rental car program, or if you are already a member, you can request a status upgrade. It typically takes a few days for a status upgrade to be reflected. Access to the Executive SelectionSM area – Executive members choose their own car from the Executive Selection area. Here you will have your choice of any fullsize car or higher class while always paying the reserved midsize rate. Guaranteed upgrades – as an Executive member, you’ll always pay one car class less when you reserve a fullsize through luxury car – a guarantee no other rental car company can make. An accelerated earning schedule – with six rental credits, receive one free rental day, or opt to receive airline miles or hotel points from one of many partners. Receive automatic E-receipts – sign up for E-receipts and your receipt will be e-mailed to you. Simply drop off your car and go. An Exclusive Reservation Line – reserved for Executive members only. Call toll-free, 24 hours a day at 1-800-732-2109 and you take advantage of savings up to 20% on your rental when you mention Contract ID 5028695. You may also book through Platinum Travel Service by calling the number on the back of your Platinum Card. You won’t have to provide your rental preferences every time you reserve – they’ll already be on file. When you arrive at Avis, you can skip the lines and the paperwork and go straight to your car at over 1,400 locations worldwide. A courtesy bus will drop you off by one of the newest cars, or you’ll find it in a convenient parking space. When you enroll in Preferred Service online, you will also enjoy automatic enrollment in My Avis — the personal service dedicated to enhancing your online Avis experience. Plus, receive a Free Weekend Rental Certificate when you use code AWD# A756900 and rent twice within a 6 month period of time. Personally it has probably been a year since I’ve rented a car. With the increased popularity of ridesharing, I just don’t really find it to be necessary as much as previously. Nowadays I just rent a car if I’m in a remote area where it’s easy to drive, and there’s limited public transportation. Most of the remote areas I travel to are also places where I don’t feel comfortable driving, so that greatly limits the places where I’d rent a car. I’ve never bothered much with rental car status, though my understanding is that National Emerald Club Executive status is probably the most valuable of the bunch. Has anyone taken advantage of the Platinum Card rental car privileges? Which do you find to be most valuable? Lucky, I’m assuming you dont have a car with this question…I sold my car yesterday and won’t have a personal car insurance policy. When you do rent a car, 1) what card do you use for insurance and 2) do you also pay for any added insurance from the rental company? I’m not sure that benefit is quite as useful as you think it is, Lucky. @ Bob — Agreed, hah. Saw that as I published. Will remote it from the post for now. Anyone know if there’s an updated code? The rental company will provide liability insurance, but I’m not sure what limits. If they are low, consider buying higher limits from the rental car company. If you have a good credit card, check out the collision damage waiver. If it’s applicable, you don’t need to buy that (or other coverage). The Amex “car rental status” is a joke. Avis Preferred and Hertz Gold Plus Rewards are the baseline names for the programs, and they’re free for anyone to join. Amex offers literally nothing with regards to status for Hertz or Avis. The National Emerald Club Exec is the only actual status they offer. The booking codes they offer also take over as the only discount you can get.. and while they do offer real advantages over the base costs, they’re still not competitive. Using Costco Travel, I can book a car for significantly less on the base, have a free second driver and still earn points/status with the rental agency. I’d really like to see a good breakdown on the car rental insurance on the Amex Plat vs the CSR and similar. There’s a LOT of confusion people have with the terms and options. The number of people who confuse the CDW coverage from the Amex Plat and the CSR as generic “car insurance” with liability coverage is staggering, and I truly fear how many people are out driving with little to no liability insurance under the false impression that they are covered by their credit card’s benefits. I know the Amex Plat offers some very basic (and secondary) liability insurance for property and medical, but a good summary and comparison would be awesome. I’ve signed up for Hertz and Avis; not yet National. Is it really that much better? With the discount I find H & A to be competitive on price with even the cheapies at most locations. Plus, having the ability to skip all lines and drive away is a big value add. For me, the 4 hour grace period with Hertz has been the greatest benefit. It saves me > $100 annually. That said, should I sign up for National? Am I missing out? I agree with straver, Avis & Hertz status from the Amex Platinum is indeed a joke. Only National status is actually worth something, you get a guaranteed free upgrade. Got the piece of s**t banged up car in Nice with no upgrade from Avis last time. Pretty horrid customer service too. @ Beachfan – California is a notable exception when it comes to rental companies being responsible for liability coverage. I don’t know of any other states like this but some like Louisiana are just hazy on the issue. I have used particularly the National Executive Club benefit. It’s incredibly nice to just choose any car I want and have had some quite nice vehicles. Budget offers something similar, but it’s within the same class. With National, it’s a much higher class and at least in the airports I’ve rented from, National has really nice cars and are definitely not stripped down models. I just received my metal Platinum card — WOW this is a nice card! The feeling is definitely premium and anyone who handles it will know this is a premium card. @Lucky: do u know of any credit card which earns rental car days (instead of miles or hotel points or cash back bonuses)? I’d love one from National or Hertz. Can you rent from Costco (or anyone else for that matter) and still get the AMEX Platinum benefits (free upgrade) with Hertz or are you required to rent directly through Hertz? With National’s One Two Free promotion it says you get a free day rental after two “qualifying” rentals. Does this mean I should book two “seperate” two day rentals instead of 1 4 day rental to get a free rental. Instead of the 1 4 day I mean.